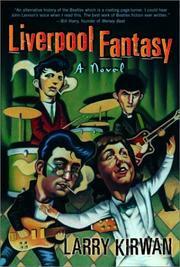 Cleverly conceived but sketchy first novel revisits John, Paul, George, and Ringo in an alternate 1987. In this world, the Beatles broke up in 1962, when John Lennon walked out of Abbey Road Studios over management's decision to release treacle instead of honest rock-and-roll. George Harrison and Ringo Starr followed him back to Liverpool, but Paul McCartney followed his crowd-pleasing, bottom-line instinct (and Brian Epstein) to America. Without the Beatles, rock withered and the ’60s never became The Sixties. When we catch up with them, George is a Jesuit priest, teetering in and out of madness, John is an embittered crank on the dole tortured by visions of what might have been, and henpecked husband Ringo is his amusing, level-headed friend, rescuing Lennon from scrapes as they cadge drinks at the pubs, occasionally sitting in on gigs with other Mersey Beat has-beens like Gerry and the Pacemakers. McCartney, now Paul Montana, is a Vegas crooner, thrice-divorced (Nancy Sinatra was first), an embarrassing cross between Wayne Newton and Sammy Davis Jr. In crisis over the cancellation of his TV series, Paul decides to reunite the Beatles and recapture the flame of youth during his upcoming trip to perform for Queen Di. The novel plays out over one day in a Britain on the brink of being taken over by the far-right National Front; Julian Lennon is one of its rising stars. The now middle-aged boys drink and fight, perform and bond, struggle with the past, and finally accept their lots. Kirwan, leader of the Celtic band Black 47, first spun his fantasy as a play, and it shows. The characters are amalgams of identifying tics that would work better as stage business, and the larger political story playing out in the background feels like caulking slapped onto the joints between acts. Moments of real vision, pathos and poetry, but never entirely convincing.